Now I know what Michael Jackson was finally talking about when he uttered the lyrics “Somebody’s watching me.” Clearly he was referring to the Eye Dot Me, a lamp created by Simon Schiessl and Felix Hardwood. 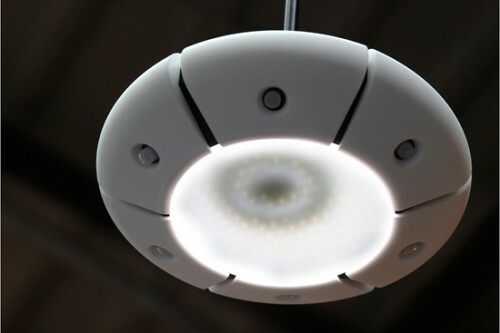 Part of the 2009 DMY Berlin Design Festival, the Eye Dot Me features a bunch of high-powered LEDs that create the illusion of an iris inside the lamp. Great for parties, but I think it’d be a little creepy eating dinner underneath this thing. That’s not a Michael Jackson song. It was Rockwell. Twas Rockwell feat. Michael Jackson… So technically we can give the reviewer the benefit of the doubt.